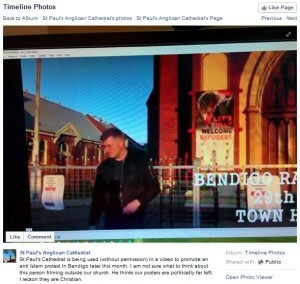 Fascist groupuscule the ‘United Patriots Front’ (UPF) has declared that they’ll be rallying in Bendigo on Saturday, August 29 in order to protest the construction of a mosque. The mosque was the subject of an unsuccessful legal challenge a few weeks ago (see : Bendigo mosque survives legal challenge, gets green light for planning permit, Rania Spooner, The Age, August 6, 2015) but may be subject to further challenge in the courts. Bendigo is of course home to ‘Reclaim Australia’ (RA) level boss Monika Evers (of ‘Stop the Mosque in Bendigo’). Evers has previously been denounced by the UPF as a liar, a thief and a traitor. Her sidekick, Julie Kendall, was present at the July 18 joint RA/UPF rally and allegedly came to the defence of Glenn Anderson (Androvski) — a local bonehead — when he was told by other ‘patriots’ to leave. Kendall & Co were also allegedly very close to members of the ‘Patriots Defence League of Australia’ (PDLA) on the day, which is interesting given that: a) the UPF is working with Ralph Cerminara’s ‘Australian Defence League’ (ADL) to organise a ‘global’ rally against Islam on October 10 and; b) the PDLA and ADL are more often than not at odds with one another (see : Authorities brace for ugly scenes as Australian ‘patriots’ plan mosque protests, Bianca Hall, The Age, August 13, 2015). 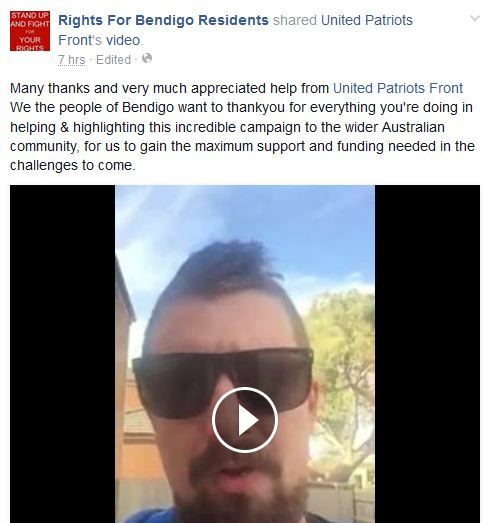 Above : Rights For Bendigo Residents thank convicted anti-Semite Neil Erikson and the UPF for their support. Whatever position Evers/’Stop the Mosque in Bendigo’ group take with regards the UPF rally, ‘Rights For Bendigo Residents’ (RBR: see : Bendigo mosque protester claims other mosque objectors face death threats, intimidation, Andrew Jefferson, Herald Sun, December 3, 2014) has welcomed the support of the UPF. By the same token, the UPF is happy to promote the funding of RBR via the ‘Robert Balzola and Associates Law Practice Trust Account’: Balzola has been actively law-talking on the part of anti-Muslim activists for some years (see : Nile party behind anti-Muslim school rally, Wendy Frew, The Sydney Morning Herald, December 22, 2007). St Paul’s Cathedral is being used (without permission) in a video to promote an anti Islam protest in Bendigo later this month. I am not sure what to think about this person filming outside our church. He thinks our posters are politically far left; I reckon they are Christian. We do not endorse his message. We will stick with the Christian Gospel. And just to be clear that means God’s love for everyone including those of other faiths, welcoming the outsider and caring for the neglected, including refugees. This entry was posted in Anti-fascism, History, State / Politics and tagged Bendigo, Blair Cottrell, Catch the Fire Ministries, Danny Nalliah, Julie Hoskin, Julie Kendall, Monika Evers, Neil Erikson, Patriots Defence League of Australia, Rights For Bendigo Residents, Rise Up Australia Party, Robert Balzola, St Paul's Anglican Church, Stop the Mosque in Bendigo, United Patriots Front. Bookmark the permalink. I’m all for free speech but I wonder what you think about Islam? It is so paranoid about the sexes – I hate the way women have to cover up as if all men are rapists. And they think Allah is perfect – that is why they can’t take a joke about him – you might change your mind about some of this kind of stuff if you had to live in a Muslim country.